There is a variety of interpretative frameworks for giving meaning to FTA activities (see Barré and Keenan in this volume). In this contribution we would like to explore an interpretation of Foresight from the perspective of the interdisciplinary body of knowledge that has become known as STS — Science and Technology Studies (c.f. Jasanoff et al. 1994). Drawing in particular on STS insights on the “social shaping of technology”, we would like to investigate the possibility of Foresight to support policy makers in influencing innovation trajectories according to societal needs. The study of technological developments is a complex issue. First of all, technologies are not given in nature, but man-made constructs; they are the products of cultural evolution. The various actors involved may use different definitions of technology. Furthermore, technologies are continuously evolving in a social context. With the further development of technologies, their definitions and relevant perspectives may also have to change. These definitions and perspectives, however, are basic to the discursive traditions studying technology and its relevant contexts. 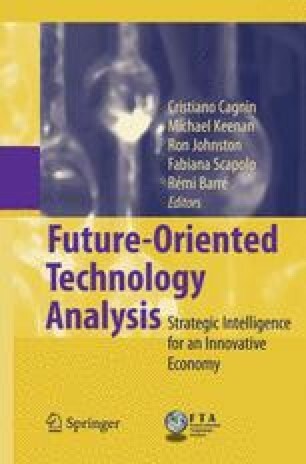 We distinguish several perspectives in the study of technology: STS dealing with social and economic co-evolution of technology, and science and technology (S&T) policy analysis and R&D management through foresight. We argue that the combination of these three perspectives challenges us to consider technological change as a complex and reflexive process. From this combined perspective, it is implied that taking a holistic view on the future by looking at societal and technological elements together and aligning or even integrating companies and users visions on the future is not at all an easy thing to do. To actually develop socio-technical future visions Foresight needs to look at societal development and technological possibilities with the same degree of openness and expertise. STS results may give some indications for Foresight practice aiming to adopt such a holistic approach.